Wind Power Energy Growing in U.S.
Wind turbines provide the clean and renewable energy for us of both home and office. 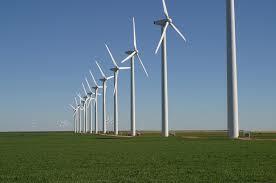 Wind Turbines are a great way to save money and keep the environment clean. The U.S. Energy Department issued two reports Monday that highlight the strength of the growing U.S. wind energy industry. The Energy Department finds that the U.S. continues to be a global leader in wind energy, ranking second in installed capacity in the world. With increasing wind energy generation and decreasing prices of wind energy technologies, the U.S. wind energy market remains strong and the U.S. is moving closer to doubling renewable electricity generation from energy resources, including wind power. “As a readily expandable, domestic source of clean, renewable energy, wind power is paving the way to a low-carbon future that protects our air and water while providing affordable, renewable electricity to American families and businesses,” said Energy Secretary Ernest Moniz. With utility-scale turbines installed in more than 39 states and territories, the success of the U.S. wind industry has had a ripple effect on the American economy, spurring more than $500 million in exports and supporting jobs related to development, siting, manufacturing, transportation and other industries, the Energy Department release said. In total, U.S. turbines in distributed applications, which accounted for more than 80 percent of all wind turbines installed in the U.S. last year, reached a cumulative installed capacity of more than 842 MW–enough to power 120,000 average American homes–according to the 2013 Distributed Wind Market Report, also released today by the Energy Department and its Pacific Northwest National Laboratory. This capacity is supplied by roughly 72,000 turbines across all 50 states, Puerto Rico, and the U.S. Virgin Islands. In fact, a total of 14 states, including Iowa, Nevada and California, among others, now each have more than 10 MW of distributed wind capacity. Compared to traditional, centralized power plants, distributed wind energy installations supply power directly to the local grid near homes, farms, businesses and communities. Turbines used in these applications can range in size from a few hundred watts to multi-megawatts, and can help power remote, off-grid homes and farms as well as local schools and manufacturing facilities.